Life of Miss Sunshade - The Vancouver SuperDALE: My health issues: Do the homework and be INFORMED!! My health issues: Do the homework and be INFORMED!! Mom feels it might be of benefit to new puppy parents if she told the hard lesson she had learned from not being as informed as she should had been when she first got me. By the time I was 18 months old, I was so lame from the injury in my right elbow that I couldn't play without coming home limping. 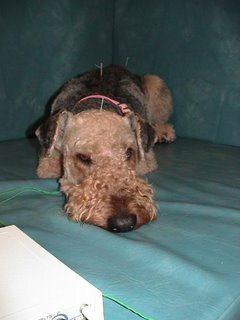 I was in pain constantly, and nothing that my conventional vet did for me helped. He gave me oral and injectable Non-Steroidal Anti-inflammatories (NSAIDs) without any success. Mom tried the surgery to clean out my elbow joint, but it didn't eliminate my pain at all and actually made it a lot worse. I was just getting lamer and lamer by the day and mom's heart was breaking. Her little 18 months old puppy was walking like a 14 year old dog. Mom was DESPERATE and ready to do ANYTHING that might just make me a little more comfortable. 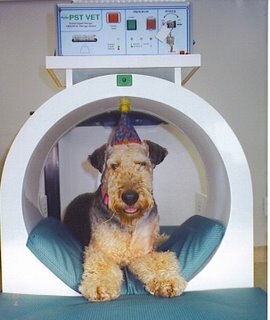 Finally when we moved to the big city, Vancouver from Victoria, mom started talking to other dog owners and learned of "Holistic medicine" for dogs. She didn't even know such thing existed for people nevermind dogs, but she was willing to try it anyway. We started seeing the wonderful Dr. Janice Crook (aka auntie Janice) from the Mosquito Creek Veterinary Hospital, and things just started to look brighter and brighter. I stopped getting owie shots and was detoxed from my previous vaccinations via homeopathy. Mom changed my diet from low quality kibbles to high quality, organic, BARF (aka Biologically Appropriate Raw Food) Diet with no grains (**grains aggravate arthritis), and added natural joint and immune boosting supplements to my diet. She also started taking me to see auntie Janice for weekly acupuncture, and auntie Gail for monthly chiropractic sessions. At the same time, mom found a rehab clinic about an hour away from where we lived and started working together with the rehab vet. They came up with a rehab plan for me which included two weekly swims in the heated pool with the underwater treadmill, and daily stretching/range of motion exercise for my elbow for mom to do with me at home. Within 6 months of starting alternative treatments and therapies, I stopped limping all together!! I became very muscular from all the swimming I did, and my muscle was able to hold and stabilize my unstable elbow joint. Mom was ecstatic because her little two year old baby was able to run and play like any other two year olds without coming back lame. We have continued all the supportive care, and I am happy to report that I am 6.5 years old now and I haven't limped in my arthritic elbow in over 4.5 years!!! Of course my elbow is still abnormal and there is nothing that could change the damage that has already been done, but at least we are able to "manage" my problem without compromising my quality of life (which is extremely important to mom)!!! Nowadays, mom gets people asking her if I was just a puppy all the time because I look so healthy and "youthful"!! I did go on to tear both of my Anterior Cruciate Ligaments (ACL) in my knees chasing squirrels back in 2003. Mom took me to Seattle, WA to have TPLO's (Tibial Plateau Leveling Osteotomy) performed by a world renowned orthopedic surgeon. I have since recovered from both surgeries and my knees are doing FANTABULOUS! You can't tell there was ever anything wrong with them. Mom again, attributed my tearing of my knee ligaments to poor nutrition while I was growing up. She thinks my ligaments were already weakened so they just snapped when I went crazy chasing squirrels. I think, however, that my ligaments were torn because I am very intense while chasing squirrels and rabbits. If normal dogs give 100% chasing, then I give 200%, and don't forget to add the percentage of my "determination" to the total. Also to keep in mind that ACL tear is very common in large breed dogs, one misstep, the ligament gets stretched or snapped and 80% of dogs who tears the first knee goes on to tear the second knee due to over compensation.